This fascinating chronicle of Catskill Mountain fire towers includes the history of the towers that once stood vigil over the heavily forested slopes on the lookout for any sign of smoke that could lead to devastating fires. At one time there were 23 fire towers in and around the Catskill Mountains. Author Martin Podskoch has researched the history of each and gathered stories of the rangers who supervised them and the pilots who replaced them. 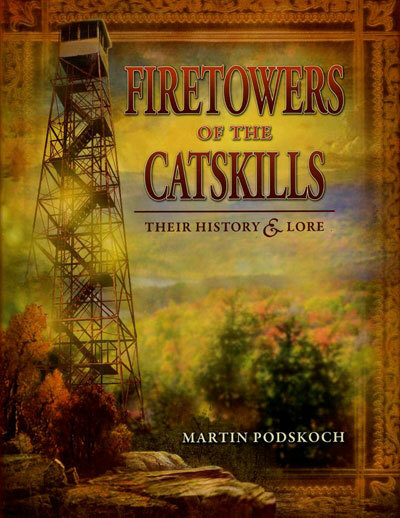 This book by author Martin Podskoch covers the 26 fire towers in the northern part of the Adirondack Park that includes St. Lawrence, Franklin, Clinton, and Essex Counties. The book contains many hundreds of human-interest stories Podskoch gathered in personal interviews, and hundreds of photographs. Danger flashes down in lightning bolts that fry telephones and make hair stand on end! Porcupines gnaw everything! Bears abound! Families survive nicely in tiny cabins, and always the towers stand and sway in wind and rain staffed by men and women dedicated to preserving our precious wilderness. 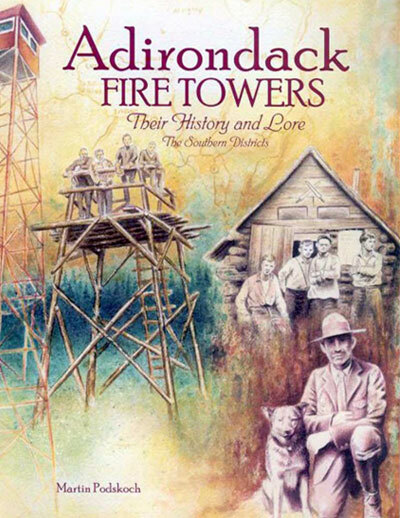 Martin Podskoch brings together the history and stories surrounding the Adirondack Fire Towers in the words of the observers, and rangers who supervised them and the pilots who replaced them in the southern half of New York State’s Adirondack Mountains. “This book tells the story of the towers in the words of the observers who staffed them, their spouses, children, and friends. Marty Podskoch spent many months of travel throughout the Adirondacks tracing down these folks. This is a remarkable piece of research and a must-read for those of us who climb fire tower summits and wonder about the towers’ history.” – John Freeman. 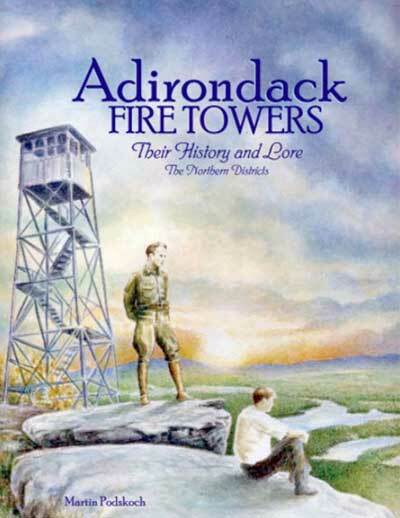 Fire towers are an essential element in the history of New York State having stood for nearly a century as guardians of the vast woodlands in the Adirondack and Catskill Mountains. While lightning had always been a threat to the forests, it was not until the late 19th century with the advent of the railroads serving new communities and expanding tourism that forest fires became a serious threat to life and property. Locomotives shot burning cinders and sparks starting fires that reached into the forests where loggers had left treetops and limbs, ready fuel for what became gigantic fires that destroyed thousands of acres, drove people from their homes, and darkened the skies in distant cities. In 1903 and 1908 the destruction was disastrous and the state was spurred by public pressure to create a new, more effective system to contain the rampant flames. In 1909 the state began to erect primitive lookout stations with observers on duty throughout the fire season perched atop crude log towers with open platforms. The observers lived in tents or log cabins nearby. Over the next decade these lookout stations evolved into metal towers with enclosed cabs rising as much as 70′ above the forest floor. Later, cabins were built to provide durable homes and the towers became a preferred destination for generations of hikers who would climb the towers for the panoramic views and listen to the lore of the nature-wise observers.